Office 365 is not immune to the basic laws of economics. If the technology does not help increase company revenue, improve employee productivity or cut expenses, few executives will commit time and resources to deploying it or invest in improving adoption and usage. While many can agree that measuring ROI is important, little consensus exists on just how to gauge the effectiveness of Office 365 and its solutions. This whitepaper is designed to provide practical advice for leaders who want to put Office 365 to work but wrestle with the challenges of justifying its value after deployment. 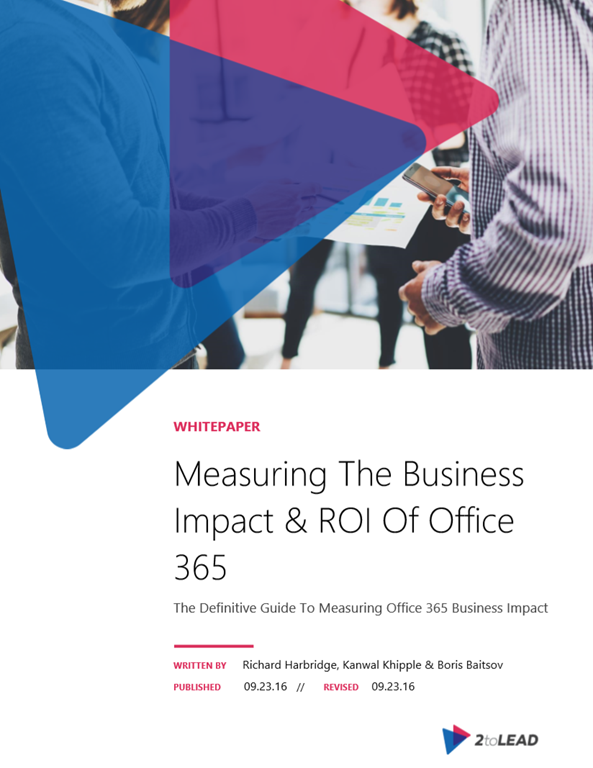 Some of the metrics discussed in this whitepaper may vary based on how you use Office 365, but the economic principles remain the same. Download this whitepaper now to help you identify the business value generated by Office 365 deployments and measure it against the costs of implementing these technologies or improving their usage. How to measure and improve business impact. What goes into defining a good business objective and how to align and prioritize them. 9 detailed and comprehensive examples of Office 365 driving business impact. Advice and a comprehensive outline of all the reporting options available in Office 365. Download the paper from 2toLead.